i love it when politics puts a hot button issue right in my lap. on top of that, i love examining laws and the constitution. in my alternate life, one that does not include forestry or blogging for a living, i would probably be a research lawyer or constitutional scholar. there has been some brouhaha over sebelius v. hobby lobby lately – freedom of religion! birth control is bad! the ACA is bad! and you should feel bad! so i wanted to look into it a little further. basically, the founders were protecting the government from being church run. it isn’t to protect the churches from the government. let that sink in. it should be noted here that this RFRA is applicable to people. excuse the lousy segue, but it’s important to know this before jumping into the next topic. in early 2012, health and human services secretary kathleen sebelius put forth the contraceptive mandate, which said that fda-approved contraceptives and services were covered by health insurance coverage at no cost. this made a lot of people happy. providing birth control for women at no cost cuts down on unwanted pregnancies, which reduces the abortion rate. why wouldn’t this be good news? when the ACA went into effect, the contraceptive mandate was a part of it. let’s celebrate! less unwanted pregnancies! healthier women! PPMD will be less of a debilitating disease! huzzah! hobby lobby is owned by some fairly religious people. they are not against birth control, per se. just IUDs, plan B, and ella, which they believe are abortifacients, despite research that says otherwise. ****** but since they are not a company that cannot religiously pick and choose its employees, they have to offer contraceptives as part of the health insurance packages or pay a hefty fine. this hefty fine is to the tune of $26 million a year if they opt out of providing insurance altogether. and because there are some insurance plans that have been grandfathered in, like life insurance for people over 75, hobby lobby is claiming that the law isn’t generally applicable as well as being a substantial burden. but the rub here is that the law generally applies to PEOPLE. hobby lobby is a business. 4. it’s a slippery slope you’re treading here. so there are a lot of things happening here that need addressing. first of all we have to address this issue of corporations as people, which we’ve heard a lot of lately. presidential campaigns always get a lot coverage about corporations donating money, and recently SCOTUS has ruled that the same laws can apply to corporations as people when it comes to freedom of speech. that’s opening a whole can of worms. 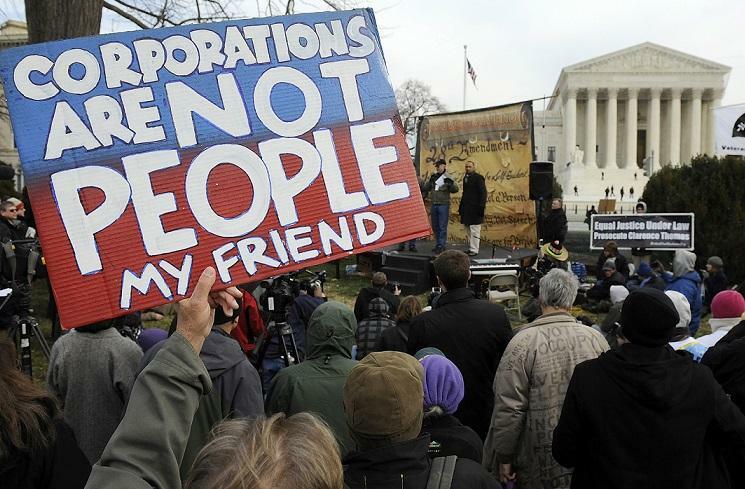 elizabeth warren in september came out against SCOTUS, calling them pro-corporation. “You follow this pro-corporate trend to its logical conclusion, and sooner or later you’ll end up with a Supreme Court that functions as a wholly owned subsidiary of big business,” Warren said. warren wrote a VERY RELEVANT BLOG POST that you should read about the current supreme court and how it’s becoming increasingly pro-corporation. if hobby lobby wins this one, and we should know by summertime, it’ll be just another notch on the corporation/SCOTUS bedpost, and yes i mean that allegory like i mean it. is this really a government of the people, by the people, and for the people? another item that needs addressing is this extreeeemely slippery slope this would be opening up if they won. what if an owner of a large business decided vaccines were against her religious beliefs and didn’t want to provide them as part of the company’s insurance package? how about certain cancer treatments? sure, you may be saying, sheesh, just go buy your own health care separately, but a lot of people who work these minimum-wage jobs don’t have the money to buy additional insurance or pay out of pocket expenses (it’s times like this i am really grateful i am a state employee). not only that, but the RFRA could start applying to OTHER items, especially if SCOTUS decides that corporations are in fact people in this case. finally, this is a perfect – PERFECT – example of why the united states should go to a single-payer health system. instead of dealing with frivolous lawsuits, SCOTUS could be focusing on more important stuff, like what to do with all those crooked bankers who got off scot-free during the recession and working on anti-trust lawsuits instead of just throwing them out (because…they’re pro-corporations, remember?). i do not think this is about birth control. this is a little about freedom of religion. this is a LOT about seeing corporations as people. this is a LOT about diminishing the value of the average joe who makes $10.25/hr versus corporation owners who make mad cash in bonuses. *******you made it! thanks for slogging through! Just want to clarify that not companies are mean bad corporations. I have never worked for a company where the owners, to include all members of the family, have their hands on everything. Hobby Lobby is truelly family run. Every meeting and project is handed down from the greens. This is both weird and unusual, but just wanted to make a clarification that some companies whether large or small still have a deep personal stake in it’s decisions. i don’t doubt hobby lobby’s convictions! i read in one of my sources that it actually spends more per year on health insurance than the fine would be for not providing it, but they want to provide it as part of the employee package. if they were truly hands off and uncaring, i think they’d just pay the fine and let their employees buy their own insurance. i’m concerned about the precedent this will set more than anything. it would open up windows for other corporations not so vested in their employees.